We serve the Gulf Coast out of our offices in Pensacola and Panama City Beach Florida. John Minor the founder of Complete was preceded in the contracting business by his father Art Minor who opened up a licensed plumbing, HVAC and electrical contractor in Gulf Breeze, Florida more than 35 years ago. Our experience with Pensacola, Gulf Breeze and the and the surrounding communities has been very special since our founding and has included restoring properties damaged by everything from fire, flood, hurricane and shoddy construction claims. We have worked every storm along the Gulf Coast going back to Fredrick, Erin, Opal, Ivan, Dennis and Hermine. Hurricane Michael hit the Florida Panhandle as a category 4 storm with sustained winds of 155 miles per hour, just 5 mph short of a category 5. Central pressure, a key measurement of a hurricane’s intensity was recorded as low as 919 millibars. This makes Hurricane Micheal one of the most powerful storms to hit the USA in recorded history. Some of the most severely affected cities include Panama City Beach, Mexico Beach, Seaside, Destin, Miramar Beach and Tallahassee, Florida. 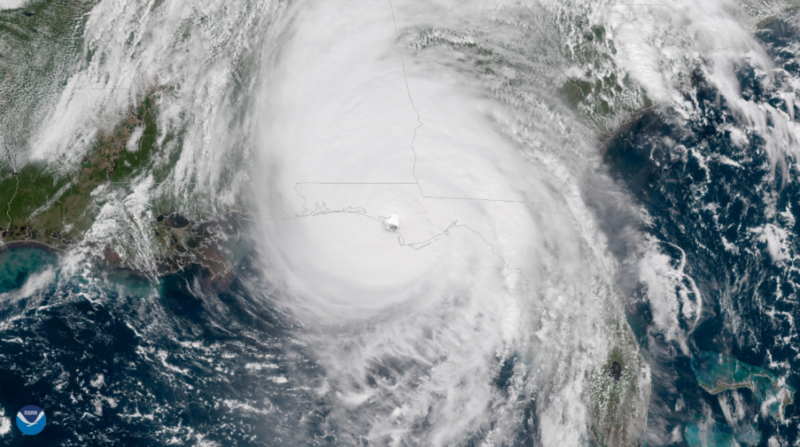 Satellite image as Hurricane Michael makes landfall on Mexico Beach near Panama City, FL. Residential storm damage in Panama City even before Hurricane Michael made landfall. 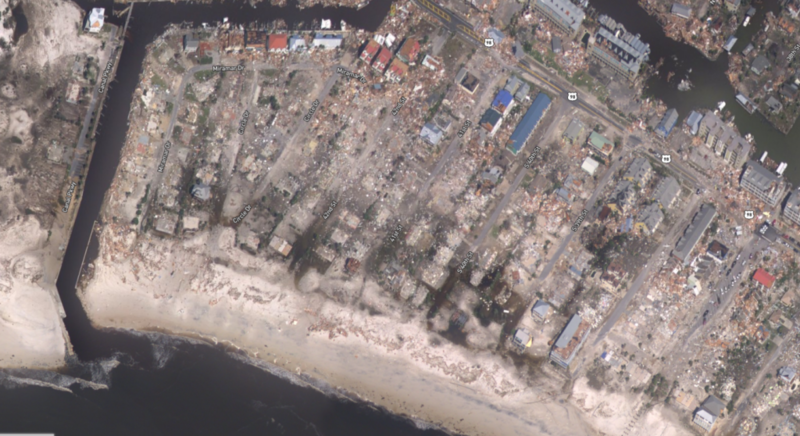 NOAA image shows homes on Mexico Beach Florida completely removed by Hurricane Michael. As these communities on the Gulf Coast continue to grow their structures get older. Destin, Panama City, Ft Walton and 30A have many original condos and beach houses that are beautiful but not always leak proof. Changes in building codes and flood plain management can change from street to street and pose a challenge as new construction is built but more importantly old buildings are rehabbed. We have restored everything in these communities from big commercial buildings to condominium buildings to individual residences. We have worked everywhere in town from being the experts at the old Vista Del Mar on Johnson Beach following Ivan, to working the Portofino condos. We serve clients like Walmart Destin for code compliance auditing, Landry’s Pensacola and Destin hurricane claims as well as large residential fire claims. In addition, we continue to provide expert witness experience to the insurers and occasional property owners. Complete maintains an office in Gulf Breeze which is our corporate office as well. We serve the greater Gulf Coast out of that office and provide hard construction services, appraisal and umpire work and building consulting. Our practice is well received by both sides of the claims that surround both first and third party claims. John Minor coachs youth football in the community and Gina Minor is part of Impact 100 and Pensacola Junior League. Team Complete has taken on a role of responsibility in the restoration of the new homes of the First Tee NW Florida. Hurricane Katrina was a devastating Category 5 hurricane that hit in August 2005. Katrina caused damage throughout the Gulf Coast of the United States, with much of the damage impacting Florida, Louisiana, Texas and Mississippi. Even Alabama was impacted by Katrina. Other areas that suffered include the Bahamas and Cuba. When the storm had made landfall in Louisiana and Mississippi, it was a Category 3. However, the wind speeds were still strong enough to cause a lot of damage in those areas. And the heavy rainfall did not help either. In terms of total loss of life and financial costs, there are very few hurricanes that have impacted the Atlantic coast in the same way. Between 1,245 to 1,836 people died either directly or indirectly because of Hurricane Katrina. And the financial costs have reached $125 billion in property damage, with the United States suffering most. Katrina is up there with Harvey as the most economically devastating hurricanes. The majority of people who died were from the Louisiana and Mississippi region. 238 people died in Mississippi, between 986 to 1577 died in Louisiana, and many people went missing during Katrina as well. Oil spills are not a common result of hurricanes, but in this case, devastating oil spills impacted the United States, with around 7 million US gallons of oil leaking into the ocean and shores. Hurricane Ivan was a long-lasting Cape Verde hurricane that devastated much of the Atlantic region in September of 2004. A major storm that started at the Windward Island, it traveled north and devastated regions including Trinidad and Tobago, Venezuela, Barbados, Jamaica, Cuba, and much of the United States Gulf Coast. When Ivan was at its strongest, it had winds of 165 miles per hour. It hit Grenada as a Category 3 before hitting Jamaica as a Category 4. It was a Category 5 by the time it reached the Cayman Islands and Cuba. The entire Gulf of Mexico was devastated, with American states such as Florida, Alabama and Louisiana suffering a great deal of devastation. Even Texas got hit hard. At reaching the United States, Ivan was classified as an extratropical cyclone. It caused 32 direct deaths and 92 indirect deaths, with many of the life loss occurring in Grenada, Jamaica and the United States. The total damage cost $26.1 billion, with $20 billion of the amount in the United States. Many of the islands in the Atlantic region suffered due to Ivan. The Cayman Islands suffered $2.86 billion in damages, while Cuba and Grenada suffered around one billion dollars in damage each. Even areas such as Saint Vincent, Trinidad and Tobago, and Saint Lucia incurred high property damage costs.